Description: The Hoax Blokes are a close group of several dozen bounty hunters from all sorts of backgrounds. All of which have and easy time working together as compadres and for mutual interests. Hierarchy: The group has a very lenient hierarchy with members all being pretty equal, however, more senior members are treated with greater respect typically and who's words tend to have more weight in group discussions and such. Membership: First off, one has to be a bounty hunters, being a registered one also helps. Also, it would be very helpful if someone had a recommendation from one of the members. Cyran Vaas - One of the founding members. 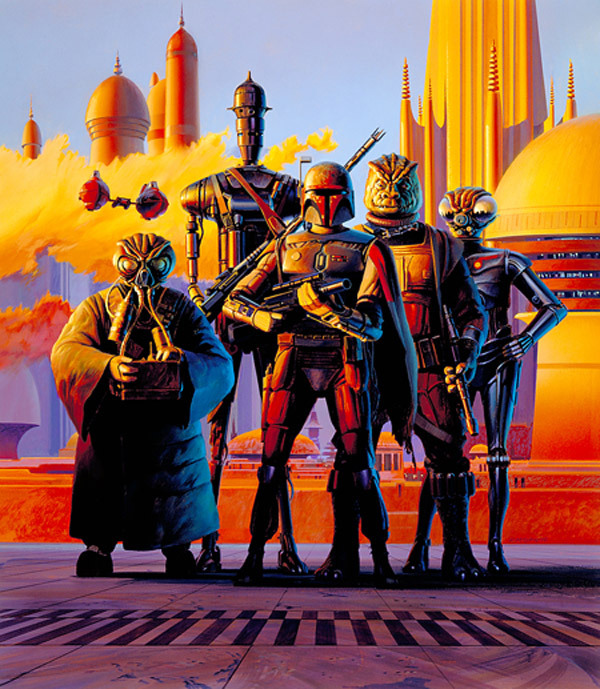 The Hoax Blokes were officially founded on Bespin after Cyran along with a group of several other bounty hunters joined forces to take on a particularly difficult hunt, each of them making quite a bit of money. Afterwards they all discussed the idea of working together more often seeing how well the worked together. Figuring that they could all make a lot more money that way then if they worked as solo acts. Thus the Hoax Blokes were founded in a seedy cantina on one of the several floating cities. After gaining some members and decent pool of credits they all had to think on how they were continue going about their work, as well as transportation. To answer some of these questions they bought themselves an old, standard CR90 Corvette, that way the whole group could travel together in a rather nice mode of transpiration. Cyran had made it pretty clear to his bounty hunter buddies that he was gonna do this slaver hunt solo. Which his friends protested against, somewhat because they felt it was unsafe and foolish to go alone. But mainly because they wanted some of the credits as well. Personally Cyran had began to feel like the planet getting knocked as far back into the stone age as it could be. All the outbreaks of crime was a goldmine for small time bounty hunters like him. Even if it meant being around all the negative emotions that seem to fill the air. Currently Cyran was in the dingy lower levels that one could say were a little less affected from the battle, it just made a rather violent place more lenient. Meaning what little safety there was no longer existed for the most part. The Zeltron was looking for a certain less then creditable establishment, which he understood was part of a larger slave trafficking ring. However, he'd be hitting a very small portion of a much larger organization. So much so that he shouldn't even being noticed on their radar so to speak. He wasn't going after the whole organization, just some members to turn in their bounties. Which he believed he only really got because he looked like Mandalorian. He felt like since he got the cheap knockoff armor he'd get far better job offers. Plus people always seemed to be more impressed, or even intimidated. Soon, Cyran found himself outside the establishment, now he just hoped that things would run smoothly and have no surprises. Cyran was on his way back from doing some small time bounty hunting in The Sith Empire's territory. However, he had willfully made a professional oversight during his time in TSE controlled space and that was the fact that he didn't process a bounty hunting, or peacekeeping certificate for the interstellar government. But Cyran thought he'd be fine. It was just quick in and out kind of job. 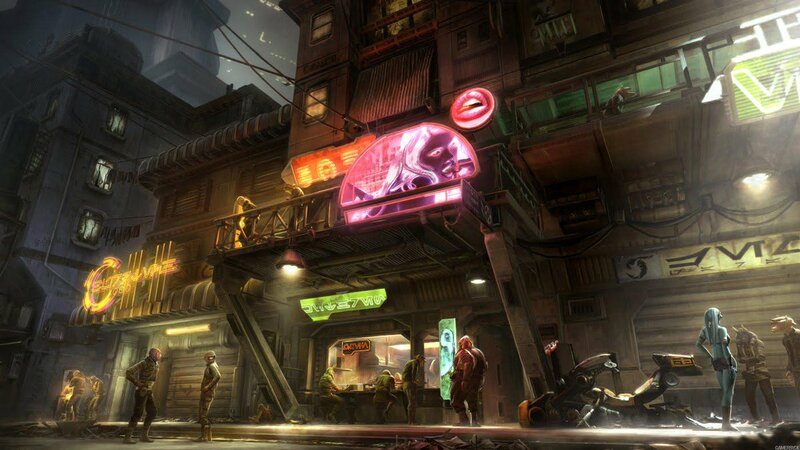 Currently the Zeltron bounty hunter was in a space station near the edge of the Sith's territory. Restocking on consumables for his Pursuer-Class Enforcement Ship. He was at his final stop before he was gonna head out of the government's borders before heading on to Coruscant for another job dealing with criminals popping up in the aftermath of the judgement day scale battle that took place there. After him and his ship were all stocked up he'd pilot his way out from the space station and into the wilds of dark space. Taking a little while to set up the coordinates for his next hyperspace jump. Effectively, he was a sitting duck. In the "lower" levels of the city Cyran commuted through the ravaged ecumenopolis. So calling some parts of it lower and upper felt kinda wrong now that all of it seemed like the lower levels. Cyran believed the battle over the planet was pointless, a mere exercise in who could cause the most destruction to a planet and her people. A people that didn't deserve such an tragedy. All these negative emotion still festering on the broken world is why Cyran didn't want to come here. As a Zeltron, feeling everyone's anger and sorrow was rough on him. Seeing a planet as big as Coruscant not in constant celebration just felt wrong to him. But as he came to learn from his time away from Zeltros, different strokes for different folks. Sometimes he'd even come across someone who'd prefer to be angry then joyful, if not at least for the time being. Where he was, the planet got hit pretty hard, which wasn't saying much from his understanding on how the not so well off the rest of the world is. From where he was in one of the lower levels, up above he could see a massive hole in the upper level allowing an equally large sun ray to pierce the planets urban surface. This was probable the first time some of the locals had even seen sunlight before, something that could be seen as so lovely caused by something so wrenched. However, Cyran wasn't here for post war sight seeing, he was on the job. Deciding to take up a bounty offer against some members of a local swoop/speeder bike gang that was making a bad situation worse for the locals. Unfortunately this wasn't a rare phenomenon. The post war trauma has allowed tens of thousands of other notable gangs to rise up and take advantage of the situation. This one he was dealing with was just a piece of hay in a hay stack, nothing special about it. Pretty much all the districts authorities are unable to quell the legions of gangsters, thus meaning they've turned to employing armies of small time bounty hunters like himself to deal with the threat. Unfortunately more then enough of these official security organizations are too bankrupt to pay the bounty hunters leading to some rather nasty conflicts. With some of the most money determined bounty hunters just ransacking the very organizations that hired them to get their moneys worth. It was a positive feed back loop of violence. Cyran just hoped that the one employing him could complete their end of the deal.